Last month’s post about the orchard pruning class resulted in lots of inquiries about what to do with a bumper crop of fruit. We are lucky that local options exist: City Fruit and Solid Ground’s Community Fruit Tree Harvest (CFTH)work with other organizations throughout the city to harvest fruit and to make sure it gets into the hands of hungry people. The easiest and most direct action to take with your surplus fruit is to harvest it yourself and drop it off at a local food bank. Solid Ground has a handy list here of local food banks, hours, favorite crops and special requirements. We encourage people to donate their produce grown using organic methods. We also ask that people wash their produce before bringing it in for donation, and only bring in quality produce. The general rule of thumb is if you wouldn’t give it to a non-gardening friend (since gardeners tend to eat everything! ), don’t donate it. We also encourage people to harvest right before delivery, to ensure freshness. If you don’t have the time or the equipment to properly harvest your fruit, volunteers will pick it for you and bring it to the food bank. CFTH can help you in: NE Seattle, NW Seattle (except Phinney, Greenwood, Crown Hill), Capitol Hill, Central District, Leschi, Madrona, Magnolia, Montlake and Queen Anne. To register your tree and request volunteer assistance, contact The Garden Hotline at 206.633.0224 or email [email protected]. Residents of Phinney Ridge, Greenwood, Crown Hill, SE Seattle, Colman Park and West Seattle can get volunteer help by contacting City Fruit. 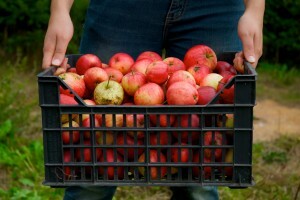 If you love to pick fruit, both organizations can always use volunteers! If you don’t love to pick fruit but want to get involved in other ways, you can do everything from checking the ripeness of fruit trees, to asking your neighbors if they would like to register their trees, to storing fruit picking equipment in your garage. Solid Ground maintains a great list of volunteer opportunities which you should check out here, along with their materials for recruiting your neighborhood’s participation like this flier which you could post in your favorite café or on the light post at the end of your block. Thanks for the follow-up Wallyhood and Kimberly! I want to mention my note was also about vegetable gardens. It’s amazing to see the many parking strips in the neighborhood bursting with tomatoes, squash, etc..
And there’s a food bank right here in Wallingford — at Solid Ground/Family Works near the library. Here’s more info: http://www.familyworksseattle.org/food-bank So, please consider donating extra/unwanted produce to support local people — those who often have little access to fresh fruit and veg.